“Analisa” is a magnificent 60 foot Hatteras motor yacht, accommodating up to four adults and two children in luxury, comfort and style. Fully air conditioned, her hand crafted wood finish throughout gives an elegant and serene interior. 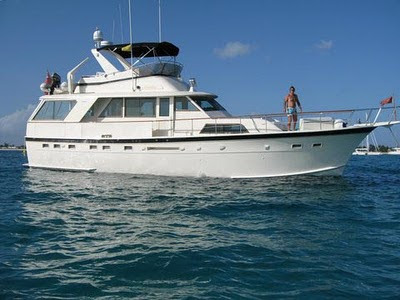 Her large saloon, opening onto a spacious aft deck area, gives more living space than any other vessel of this length. Her aft deck area gives the opportunity to relax and dine in comfort. Her array of toys gives you the chance to try out all water sports and provides fun and entertainment for all the family. The Virgin Islands offer the most spectacular setting for your Caribbean cruise. Warm, blue, crystal clear waters await you. These are the islands to explore the beauty Mother Nature offers. Each guest cabin has en suite bathroom facilities with enclosed shower stalls. Large closets and high quality Egyptian cotton sheets ensure your comfort. TV and DVD in each cabin. No yachting experience is necessary. Your safety and enjoyment are our highest priorities. Our aim is to make your dreams come true, and give you and your family the holiday of a lifetime. Just pack, arrive and enjoy!